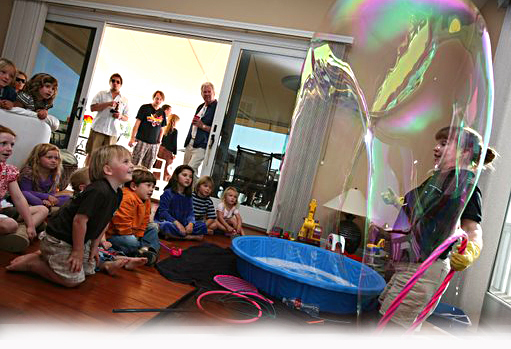 Soap bubble is a thin film of soapy water with iridescent surface. Balloon-old soap usually just a few seconds later dispersed itself or because it touches another object. Often used for children's games or performing arts. Leather soap bubble consists of a thin layer of water trapped between two layers of molecules, usually soap. Soap bubble is formed because the surface of the liquid (usually water) has a surface tension, which causes the elastic layer. But the balloon is formed from liquid alone is not stable, and surfactants such as soap must be dissolved in it to make a balloon stable. Soap bubble blown in air with temperatures below -15 ° C will freeze when it touches a surface. The air inside it will come out slowly through the process of diffusion, so that eventually the balloon sinks. At temperatures below -25 ° C, the balloon will be frozen in the air and can be broken when it fell to the ground.